The RTW TM3-3G is a compact and flexible audio loudness meter designed specifically for use with 3G SDI digital video. The meter extracts up to eight audio channels from the incoming SDI bitstream and displays their level and loudness parameters on software “instruments” defined and arranged on-screen to suit the operator’s preferences. License options additionally enable BBC-style moving coil PPM emulation, full 16-channel de-embedding, with the audio available externally as eight balanced AES3 pairs, and/or a stereo analogue output for audible monitoring with on-screen level control. Supplied with Devicer DC1 software application (Windows or Mac) for creating user-defined presets. 2-channel or 6-channel RTW TM3 TouchMonitors, offering a range of digital and analogue audio inputs, are also available for non-SDI installations. The TM3-3G further expands the RTW range of touchscreen audio metering and analysis displays for use in professional broadcast and post production. Stylish and neat in design, the unit may be used in either a vertical or horizontal orientation. It provides the user with accurate sound level and loudness measurement of up to eight channels of audio in broadcast environments where SDI is the normal method of audio/video distribution. The TM3-3G consists of the display, an interface box with all I/O, and a separate PSU. The interface box connects to the display with a single 2 m cable giving great flexibility in mounting. The TM3-3G is designed to interface directly with SDI broadcast infrastructures. It is compatible with all current SDI formats: SD (525i & 625i), HD (720p, 1035i, 1080i, 1080p & 1080SF) and 3G (1080p). A BNC loopthrough output is provided to feed downstream equipment. 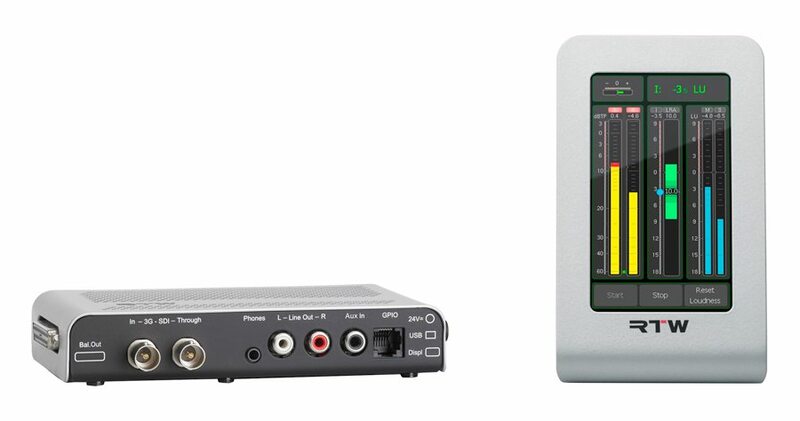 The TM3-3G can extract up to eight of the sixteen audio channels within the SDI bitstream and display the information in wide variety of ways on a 4.3” 480 x 272 pixel colour touchscreen. Users may configure screen layouts to include whatever combination of “measurement instruments” is appropriate to the task. The layouts are entirely definable by the user using the Devicer DC1 software application (downloadable from the RTW website www.rtw.de); each instrument’s display is a window which may be made active, sized and positioned at will. All instrument controls are accessed via the touchscreen. 30 user presets are provided for storing the most commonly used screen configurations, and smartphone-style technology is employed to permit selection of these by simply “swiping” across the touchscreen with a finger. The TM3-3G provides loudness/SPL measurement compliant with EBU R128, ITU BS.1771 and ATSC A/85, including the Loudness Range (LRA) display. The LRA measurement employs RTW’s unique MagicLRA mode; this innovative display shows Loudness Range as a moving graphic block, the instantaneous loudness value as the block’s vertical (or horizontal) position, and the programme’s dynamic range as the width (or height) of the block. PPM metering is also available as standard, with a wide range of digital scaling options: -60 dB or -20 dB to + 3 dB TruePeak, quasi-DIN -50 dB to +5 dB or +10 dB, quasi-Nordic, quasi-British IIa/Iib, ARD9), with Peak Hold and Zoom modes. Phase correlation metering, Dialnorm measurement, SPL metering and an SDI status bit monitor are further instruments. The flexibility of the TM3-3G can be increased with additional options, which are supplied in the form of software licenses. The TM3-SWMC software licence allows the TM3-3G to emulate a classic ‘BBC-style’ dual-needle moving coil PPM. In addition to the standard red and green needles for left and right channels, the display adds a shorter third (blue) needle indicating loudness units. Peak and integrated loudness values are also displayed numerically. The TM3-SWDEEM option allows de-embedding of all 16 channels in the SDI bitstream, these being made available in balanced AES3 format. The TM3-SWMON option adds monitoring control functions – level, Dim, Mute and Solo – to the unit, with stereo analogue audio outputs being available on phono and 3.5 mm jack connectors. It also generates a stereo downmix for compatibility checking. Other connectivity includes a GPIO port to permit external selection of presets, and a USB 2.0 port to allow connection to a PC or Mac for configuration, or option installation.